The Toffee Man is a franchise that has been operating throughout Scotland for decades. They rely on children to sell toffee, tablet, macaroon and coconut ice in local areas for a commission on sales. This commission is currently set at 25% of the recommended selling price. Working for The Toffee Man is very easy and most job opportunities are advertised locally in newspapers such as the Evening Express on the job page and usually says something like The Toffee Man requires Boys and Girls for Toffee rounds in your own area followed by a contact telephone number or mobile phone number. Simply make contact and The Toffee Man will deliver an assorted box of sweets to sell for payment. Most local authorities in Scotland allow children over the age of 13 years to work part time so long as it does not interfere with school or college studies. It is best to check at the school office before working for The Toffee Man and sell sweets for payment. There is no need to pay for the sweets at this stage. You will get a set time to sell the sweets and when The Toffee Man returns to restock your toffee, macaroon, Scottish tablet and coconut ice you hand over the payments less your commission. So at no time should you have to use your own money. 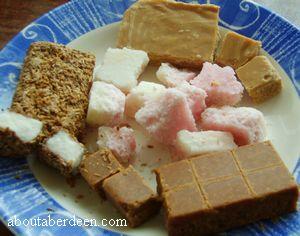 In 2007 the price of each slab or bar of toffee, macaroon, Scots tablet and coconut ice was 70 pence each and the minimum you are asked to sell is 60 bars. This works out at �42 per box. You give The Toffee Man �31-50 and keep �10-50 as your pay. If I have done my calculations correctly then this works out at just over 17 pence per bar sold. This is often supplemented by tips and can add between �5 to �10 a week in tips, though this will vary from toffee round to round. Most people slip a friendly and charming toffee round child a few extra pennies and some generous Scotsmen and women even let them keep he change from �1. These rates of pay may vary and are given as examples for information purposes. Please do not be tempted to increase or decrease the set price of each bar of toffee and other confectionary. You must sell them at the recommended retail price. Do consider though that the advantage of working for The Toffee Man is that few people can resist buying toffee, tablet, etc. It is a bit like the ice cream van stopping outside your house, you hear the jingle and fancy an icer. To increase your chances of a sale be polite and display your sweets to their best. For example rather than holding out a box of all toffee for customers to see our tip would be to have a box neatly displaying a selection of each bars. As your toffee round progresses you will soon know your best sellers and know what to display and restock from The Toffee Man. As your trust is earnt by The Toffee Man you can ask for more boxes to sell at each delivery. As your customers trust you they will soon look forward to your visits and buy more toffee, tablet, etc. So concentrate of getting a good reputation: close gates, don't jump over fences, take home your litter, look smart and keep your finger nails clean! Densely populated areas will give you more customers and large families are more likely to buy several bars at a time. Some people who work for The Toffee Man find that they sell more sweets door to door in their own neighbourhood where neighbours and friends know them, trust them and want to be helpful by buying toffee and getting a treat without having to leave their home. Do consider buying an A to Z street plan of areas you work in so that on your initial few visits you can visit each house. Write your routes down and let your responsible adult know where you will be visiting and after visiting each house on different days you can soon learn who buys from you and who does not. That way you can soon learn to know which homes to avoid because they never buy from you or are rude and to be avoided for your own safety. The positive thing from this is that you will be able to have a list of homes that buy from you regularly and soon you will have regular customers you frequently buy from you and this will save you a great deal of time. But do blanket drop new areas to drum up new customers, sell more toffee and get more pocket money. So for example if your parents are going to the supermarket or to visit friends then jump in the car with your Toffee Man goodies and whilst they are in the shop or chatting with friends get selling. Agree a time to meet back with mum or dad and you will have saved your bus fare home whilst your parent picks up the cost of petrol mileage! Another option to easily sell toffee if you already do an after school job like a paper round is to deliver the newspapers and sell toffee at the same time. With the permission of the manager or warden you could also try residential homes or sheltered housing. Other tips for working for The Toffee Man is to keep a supply of 10 pence pieces so that you can give customers their correct change. You may wish to write on your box the cost of multiples of sweets so that you can quickly tell people how much they need to pay for a set amount of sweets. This can help you avoid any mistakes in wrong prices or giving people the wrong change. If maths is not your strong subject then carry a calculator. Other advantages of working for The Toffee Man is that you get your own round in a area so will not get troubled by other sellers having already visited customers at home. 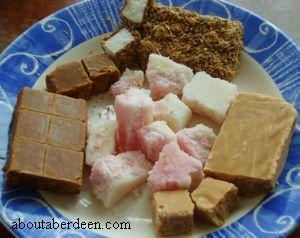 Each slab of toffee, tablet, macaroon, coconut ice etc are carefully cellophane wrapped so adhere to food hygiene laws. They are marked with a sell by date. It is rare but some adults can work for The Toffee Man and earn an extra part time wage. It is more common for an adult to be an area Toffee man and recruit new children to toffee rounds, deliver and collect toffee and money, give advice and support, etc. This can be a full time job in large areas like Aberdeen City or part time in rural areas like Boddam, Peterhead, Mintlaw, Ellon, Stonehaven, etc. The largest expense will be your time and petrol in delivering the supplies. For example if you live in Balmedie and have an enquiry from New Pitsligo, Turriff, Inverurie, Oldmeldrum, Kintore, Banchory or Cruden Bay then it may not be worth recruiting this new Toffee man member, unless you can plan the drops and collections into a route that takes you near there to save on mileage. Though if this is a self employment you can claim this as a tax expense on your income tax return sheet. Other expenses such as job advertisements to recruit more toffee men, women, boys and girls can be added to the expense sheet. You should also declare any earnings and profit to the inland revenue and be prepared to pay tax and National Insurance contributions. Children under 16 years of age should not have to pay tax or NI. There are few disadvantages to working for The Toffee Man. Sadly one of these is that you may be at risk of mugging or theft because you are young and carrying cash. You can reduce this risk by not going to unfamiliar areas and avoid working in the dark nights or unlit, isolated areas. An attack alarm could be useful to carry, these usually have a cord that you can slip round your wrist or tie to a jacket zip and pull quickly and easily to activate. Do try and carry a mobile phone so that you can contact a parent, friend or relative in an emergency. Most customers will be polite and like your visit - I can't resist buying toffee for my family whenever boys and girls come to the door and the sweets are really tasty and most people will agree. However you will get the odd person who is rude and may enjoy teasing you or gets angry with you for disturbing them. It is best to just politely say goodbye and walk away and concentrate on providing a service to the nicer people in life. Working for The Toffee Man and selling sweets for payment is a rewarding job that can be a great source of extra pocket money. Toffee Man Jobs will be listed here. If you are a Toffee Man and would like your contact details and areas of work available listed here for free then please contact me. I would particularly like to hear from anyone in the Buchan and Broch areas as well as Aberdeen and Aberdeenshire and other parts of Scotland because I have had children in Boddam, Peterhead, Newburgh and Fraserburgh looking for Toffee man work. Other areas where children would like to know about The Toffee Man include Whitburn and Pumpherston near Edinburgh in West Lothian and East Kilbride near Glasgow.  Please note that the information on this Toffee Man page is for info only and rates of pay, commission and terms and conditions may vary from area to area and for each Toffee Man. The official website for The Toffee Man will be listed soon. The Travelling Candy Store is another option for children to sell sweets for payment. The contact telephone number for the Travelling Candy Store can usually be found in the Evening Express and local newspapers job pages. More Job Vacancies In Aberdeen and Aberdeenshire.